The Isle of Man, Speedway, the weekly Matlock Bath bike meetings and the MCN Live party weekend in Skegness - to name but a few events worth considering. Don’t miss out on going to an organised event this year; they’re a lot of fun. After all, isn’t that what motorcycling is all about - well at WeWantyourmotorbike.com we think so! 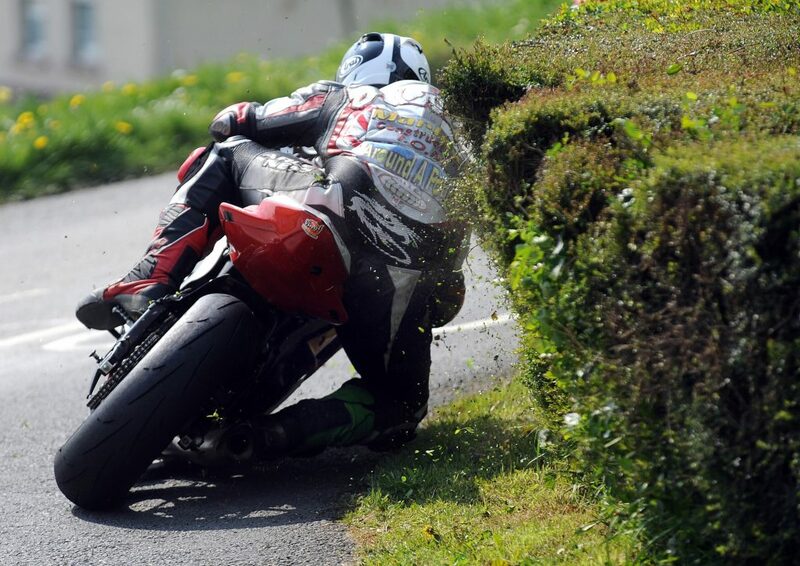 If you’ve never been to Isle of Man TT races, then it’s time you did. If you can’t afford two weeks off to go, then skip the first practice week and go for the last few days of race week. Briefly, the circuit is 37 miles of real road all around the island. 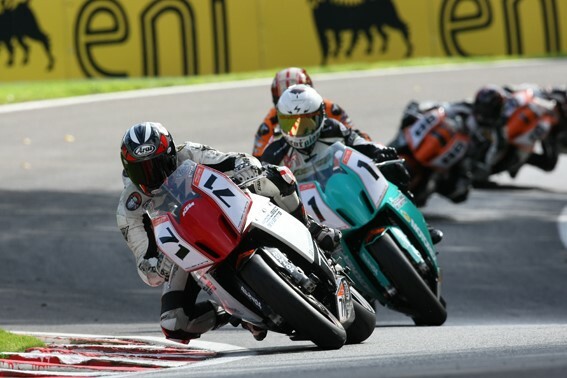 There are races for most classes from Lightweight, all the way up to the Superbike class - the most prestigious being the 6-lap Senior Race. That’s over 220 miles flat out, at an average speed for most of the top riders, of around 132mph. There are great viewing points for spectators in the towns and villages. However, some of the best places to watch are on the northern mountain part of the circuit. Watching racers like John McGuinness, Guy Martin and Ian Hutchinson hurtle past stone walls, hedges and red pillar boxes on their 200 plus horsepower machines will leave you breathless. If you plan it properly you can use your bike to travel to the best spectator viewing points well before they close the roads for racing. Just make sure you check the programme or local newspapers for road closure times. Give yourself plenty of time to get to your preferred viewpoint and you won’t be disappointed. My favourite spots are Glen Helen, Kirk Michael and Creg-ny-Baa (because there’s a pub there). If you get a chance, the pit lane is a good spot for at least one race. You can watch the timed starts as they roar off down towards Bray Hill. The refuelling and tyre changes are always exciting to watch too while you’re listening to the race commentary on the radio. It’s not just the racing that makes it a great event. Douglas is the main hotspot, especially for spontaneous biker parties, but there’s so much entertainment in the clubs bars and pubs throughout the two weeks. Having a good time is pretty much guaranteed wherever you go. Be sure to go to the RNLI Charity Beach Race at Port Erin. Sitting on the sea wall with a handful of freshly cooked fish and chips and watching tough motocross racers bashing each other out of the way is one of my fondest memories. There is always plenty of camping on the island, but if you’re going to stay in a Hotel or B&B you need to book early. This event has been a big favourite for 22 years and this year’s bash is going to be the last one, so make sure you don’t miss it. Organised by MCN, they promise to go out with a bang, so take plenty of Nurofen. There’s always fantastic daytime entertainment spread over the three days. You can take your own bike on a dragstrip, go on a ride-out, watch short track racing and stunt riders like Steve Colly (above), or have a go on a mini moto - it’s a laugh from start to finish. You can even try riding off-road this year with the Yamaha AMC MX Experience. The event is held at Skegness Butlins and has always been famous for a huge number of live bands. For 2016 they’re pulling out all the stops with more live acts than ever before; there’ll be music and entertainment for all tastes in two huge venues. This year the ‘Morecambe Missile’ John McGuinness along with Chris Walker and John Reynolds will be entertaining the crowds with on-stage interviews. They’ll also be leading the ride-out so you can tell your grandchildren you rode with some of Britain’s racing legends. It’s a full on weekend, so you might want to take Monday off work to recover! If you can’t make it to this one then the ‘Withernsea Bike Fest’ near Hull is another great weekend for bikers, usually in held August. It’s pretty much the same kind of thing as MCN Live with stunt riders, ride outs and great evening entertainment. But the best thing about this one is it’s FREE!!! 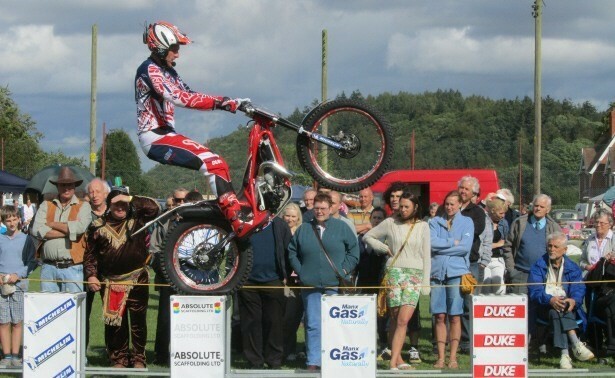 Matlock Bath Biker Meet, Derbyshire. 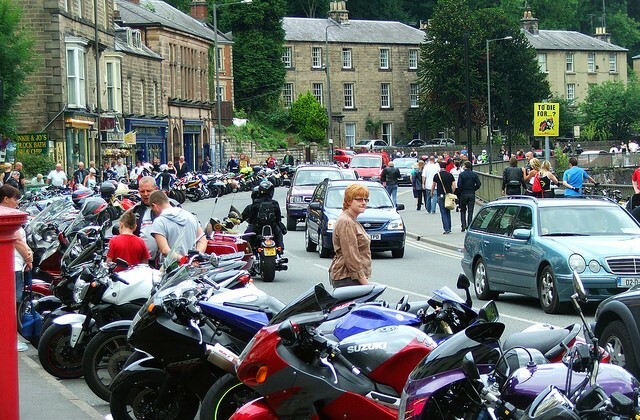 Situated in the picturesque Peak District, Matlock has become a magnet for motorcyclists for years. These gatherings take place every Sunday and sometimes Saturdays throughout the summer months. The Matlock Bath main street resembles a sea-side promenade with lines of parked motorcycles. 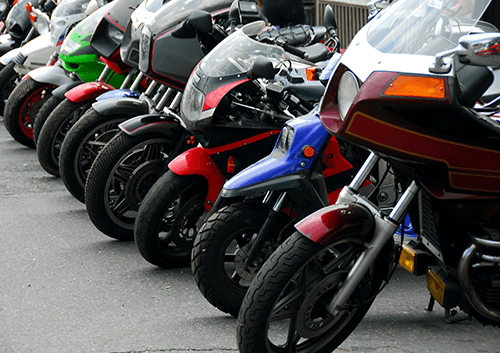 Motorcyclists from all walks of life are welcomed by the friendly residents of Matlock. If you’ve been out for an early morning blast with your mates, be sure to visit Jay-Cees Caff for a superb breakfast. Bikers are always made welcome. There are many other hotspots for bikers that have gathered their own momentum over time. For example, Boxhill in Surrey is one of them. Every Sunday motorcyclists converge on Rykers Burger Bar for a chinwag after a ride on the country roads. You get quite a good mix of bikes from vintage classics to full on tricked-up supersport machines. If you’re ever ‘Dahn Sarf’ then drop by. We’re lucky in this country to have so many world class circuits: Silverstone, Brands Hatch and Donington Park. There are other great circuits too, like Cadwell Park in Lincolnshire and our very own Oulton Park in Cheshire. Take a look at a map and you’ll see that there are many more all over the country, so there are no excuses now. You’re never far away from either a top class MotoGP, BSB, WSB or a Club meeting; where you’ll be surprised at how fast some amateur racers really are. If you’ve never been to one it’s time you did. For a full day’s entertainment they’re great value for money. You can check out race dates on all circuit websites. Speedway has good TV coverage, but there’s nothing like going to a track. The noise, the unmistakeable scent of ‘Castrol R’ in the air and the crowd cheering for their home team; this part of the atmosphere you don’t get sitting on the sofa. Speedway is a popular sport in the UK and Europe and race events are usually held in the evenings. Teams from two different towns compete against each other for points. You get a lot of tactical riding between teammates which makes it all the more exciting and at the end of the night the team with most points wins. Teams are in different leagues, like football. There’s an Elite League, a Premiere League, a National League and a Junior League; they’re all hotly contested. Our closest is probably the Belle Vue Aces in Manchester. Their home track is situated in Kirkmanshulme Lane. Check out your local team and give them some support, it’s addictive. Welcome to the Hard School! 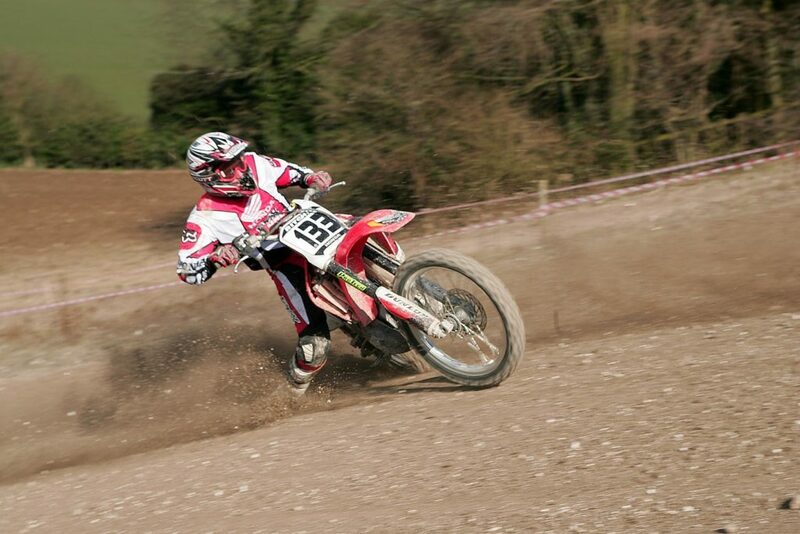 Motocross is non-stop action. Riders are elbow to elbow from start to finish. Wherever there’s a battle going on, at the front, in the middle or at the back of the pack - it’s all good fun to watch. Each class has a practice, a qualifier and then 3 X 20 minute heats during the day. Most clubs will stage two Junior Classes and two Senior Classes - that’s a lot of racing in one day so there’s no time to be bored. If you can get to an International event you’ll see just how skillful dirt-bike riders really are. You won’t believe how fast they can go over a rough, bumpy surface or how far they can leap over table-tops on their machines. Local club events are sometimes organised in a farmer’s field, but there are quite a lot of specially prepared circuits dotted around the country. It’s well worth finding out your nearest venue for a great day out. These are just a handful of events and suggestions for you to think about this year, but there are many more biker events held all over the UK that are well worth a visit. That’s if you can fit it all in! Heard of any other great events to go to in 2016? Then we’d like to hear from you. Write to us on Facebook or Twitter to share your tips. 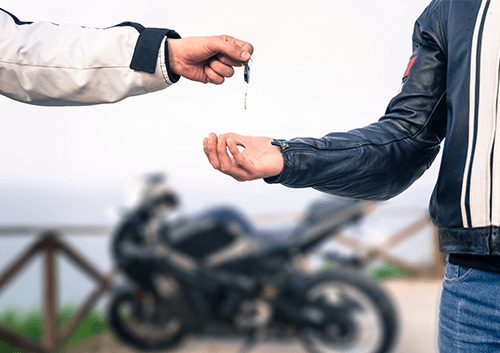 Ready to sell your motorbike? Put your reg in now and we’ll give you a great offer. Prefer to phone? Call 01625 353014 and our friendly valuations team will guide you through the process. If you’re looking for the best place to sell your motorbike online, why not get started with a free, quick and accurate valuation from us here at We Want Your Motorbike? All you have to do is enter your registration number above, as well as some basic information and we’ll have a valuation with you in under 24 hours. How Much is My Motorbike Worth? 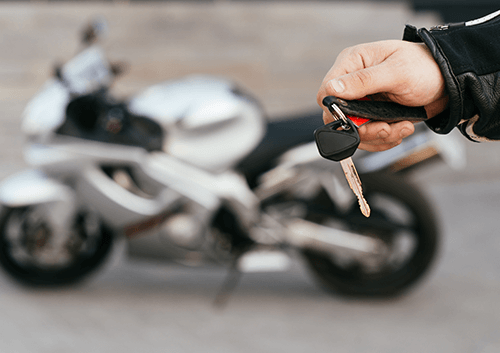 If you’re asking ‘how much is my motorbike worth?’ find out what contributes towards a bike’s value and request a no-obligation offer from our bike buyers.